I am getting on quite nicely with this kit. 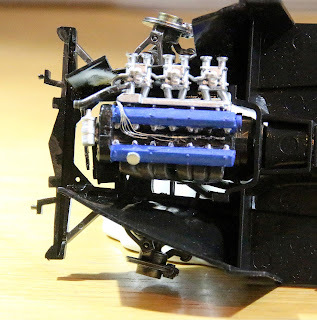 It is always a joy to return to a Tamiya kit as they do make them to go together well. So far, I haven't found anything that needed trimming, filing or fettling. Everything has fitted perfectly. In fact, the old adage still applies. 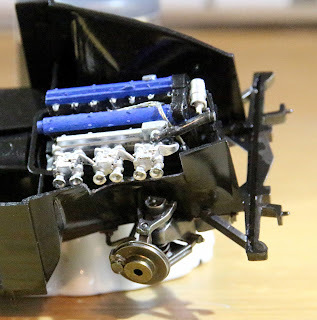 If a part doesn't seem to fit properly then you have got it in wrong - Tamiya almost never get it wrong (I say almost but I really think that they "never" get it wrong but that is to definite a statement!). 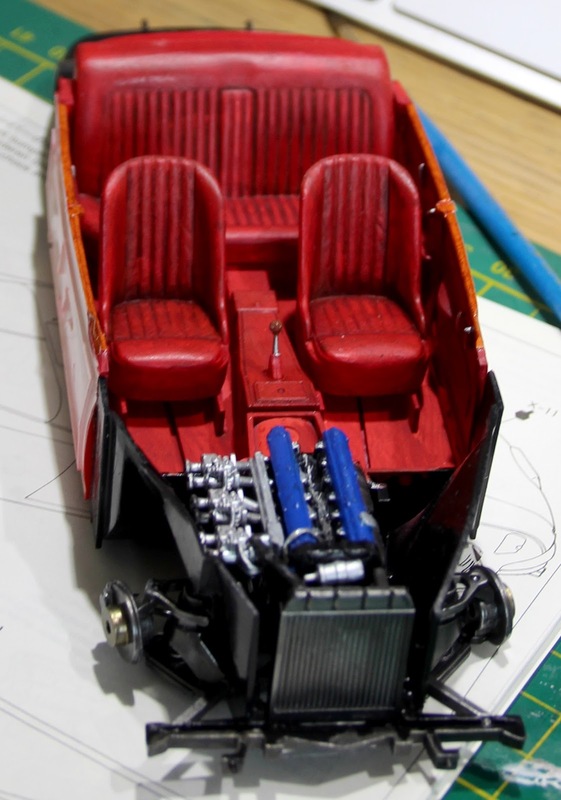 I have finished the chassis and completed fitting out the interior except for the dash board. The real car interior is a mix of red carpet, material and leather. I decided that I would try and put some 3d effect into the seats and door cards* by using my Andrea Color Red Paint Set. This is actually designed for painting British Army uniforms from the Napoleonic period but its five shades let me put some depth into the seats. However, there is one element of the kit that I haven't enjoyed. This involves the decals. Well, actually, there are two issues that I have with the decals in this kit. The first is that they take a very long time to release from the backing paper. I found that I had to stack the decals up in the bowl so that, once the first one was on the go, the others were nearly ready. 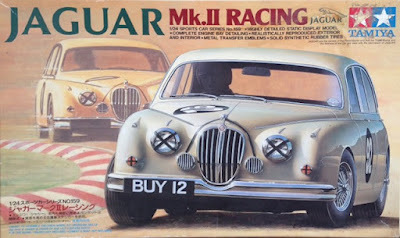 The second issue is with the decals for the nicely varnished wood all around the Jaguar cockpit. The wood runs along the top of the doors and is all over the dash board. Here is an image of the dashboard as it is at the current time. I still need to finish off the painting but it shows you how hard it is to manage all of the little bits of decal that fit around the dash detail. Please remember that it isn't meant to be seen this close up. At normal distances and buried inside the car, it will look a lot more natural. 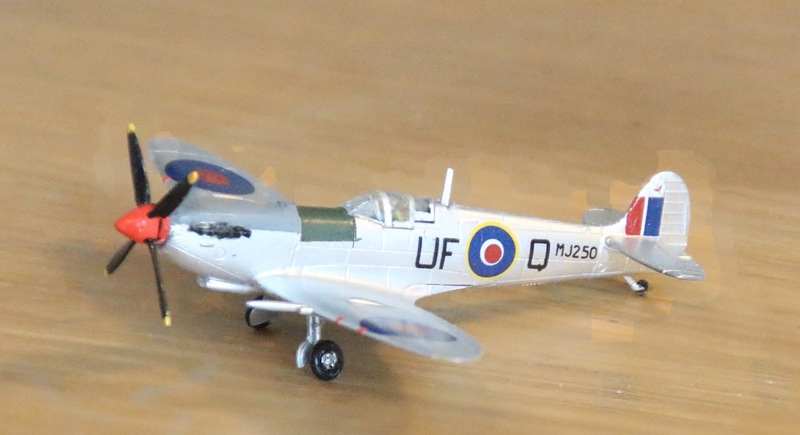 Obviously, I still have the knobs, switches and the radio/speaker to detail but you can see how the decals convert the dash to a wooden one very effectively. I still marvel that they didn't strip the car for racing. It really did race with carpets and wooden trim! I have sprayed the body white and am looking next at putting the metal stripes onto it before I give it a coat of Klear. Once that is done, I can decal up the rest of the car and follow that with a coat of two pack varnish. All that will be left then is to fit all of the chrome parts and the wheels. Cor, I might really finish this soon! * Door cards. I have always called them door panels but I have been watching Wheeler Dealers lately and Edd China always calls them door cards, so I follow his knowledgeable lead. 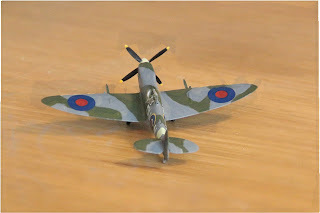 I have finished both Spitfires. In spite of their small size, I found them quite time consuming to complete. They were very fiddly and needed a lot of work. First off is the more normal Spitfire in camouflage. This is the Spitfire Mk IXc flown by Otto Smik, No. 312 Squadron, North Weald, Late August 1944. There is always a saga with any aircraft that I build and this was no exception. As mentioned, I lost one of the tailplanes. This meant that I had to make a new one from plastic card. I measured the thickness of the existing part which came out at around 1mm but when I used 1mm card it seemed way too thick. I reverted to two layers of 0.2mm (I didn't have any 0.4mm to hand). I had a couple of goes at it and finally I got something that looked the part. The tailplanes look a bit askew at this angle but they actually sit on the tail OK. Once painted, it looked fine. What next? 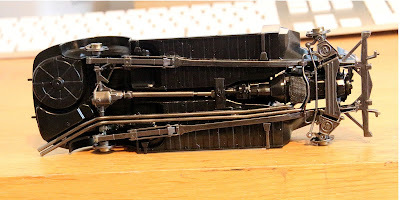 Well, the radio aerial is moulded onto on side of the fuselage so, with all of the handling, this got knocked off - as it usually does with me - even if I try hard. I got a length of 0.7mm brass rod and flattened it with a small hammer. I then filed it to shape, cut it to length and fitted it using Gator's Grip glue. As you can see from the top image, this came out OK.
Lastly, I had a brain storm and painted the two greys in the wrong order. The upper surfaces got painted in medium sea grey and the lower in ocean grey - wrong! Having sprayed all of this, I really didn't want to go back to masking everything out - especially the upper camouflage - so I hand painted the greys in the opposite way. 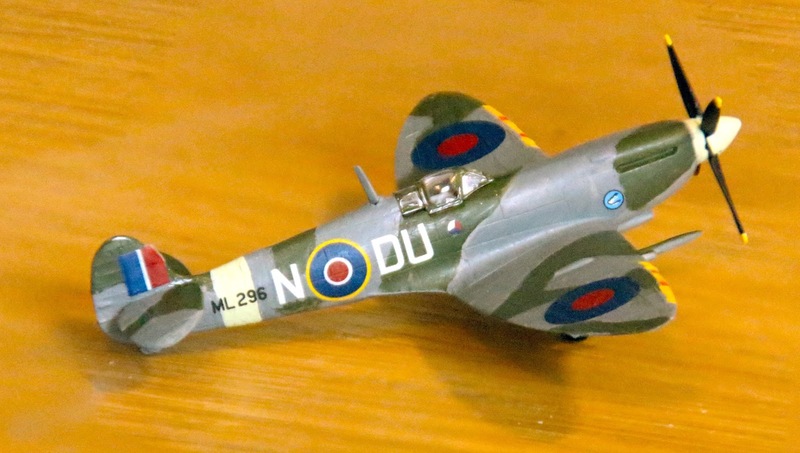 The second Spitfire was an unusual one. It is MJ250 from No. 601 Squadron in Italy during the Summer of 1944. This is unusual because it is in bare metal. The normal reason for this is to eek out as much top speed as possible. The interesting thing about the scheme is that there is the usual anti-glare panel on the upper surface of the nose which is normally painted a matt black. On this aircraft it is dark sea grey and dark green - although I used medium sea grey so I got that wrong! This one went together quite well. The finish is the new Vallejo acrylic Aluminium paint which I airbrushed on over a coat of Vallejo Gloss Black primer (just released to go with the metal colours). This finish seems to be as good as I would get by using Alclad. The big advantage is that I don't get my wife complaining about the smell. As mentioned, I also had to replace the radio aerial on this aircraft as well.